Electrochemical processes and methods are basic to many important scientific disciplines, materials science and nanotechnology being only two keywords. For the first time in more than twenty years this volume presents a critical survey of the foundations, methodology and applications of electrochemical phase formation and growth processes. Written by a team of three internationally renowned authors, it is an invaluable source of information for all scientists concerned with electrocrystallization of metals or the in-situ characterization of electron-conducting surfaces. Not only the numerous illustrations (partly in colour) but also the vast number of references covering the literature up to and including 1995 make this volume indispensable for every laboratory working in electrochemical or materials science. 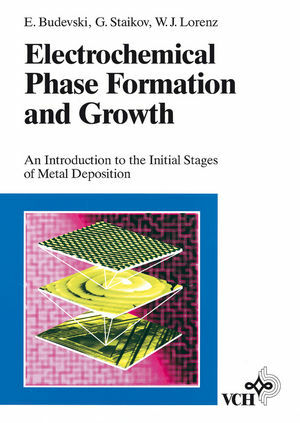 Evgeni B. Budevski and Georgi T. Staikov are the authors of Electrochemical Phase Formation and Growth: An Introduction to the Initial Stages of Metal Deposition, published by Wiley. ... This book is an excellent introduction to the field of metal electrodeposition. It reports many of the latest, state-of-the-art experimental observations, the theory of which is explained in a clear and comprehensive manner. It can therefore be warmly recommended to all electrochemists.